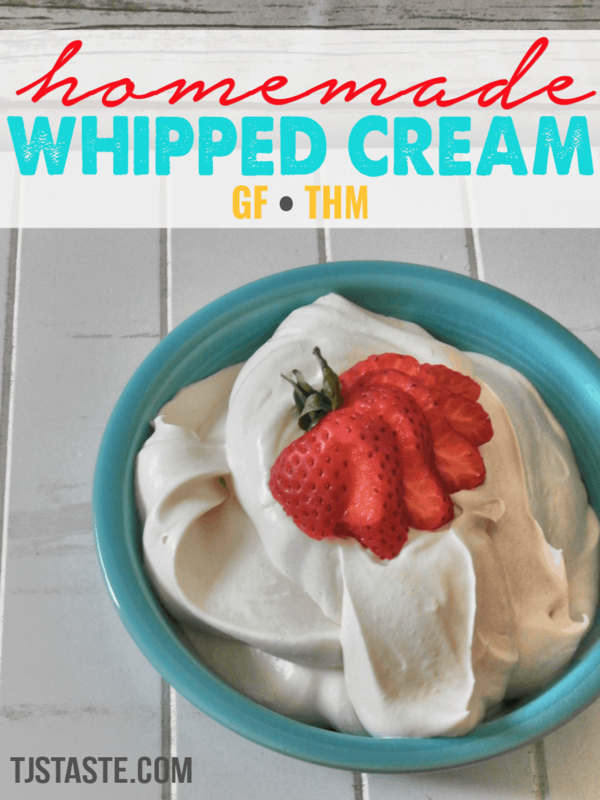 Kick Cool Whip to the curb and can the whipped cream can because making your own homemade whipped cream is easy, delicious, fun, and, yes, even healthy! Unfortunately, in this age of pre-made everything, the tasks of making even simple basics like homemade whipped cream are becoming a lost art. Many people are even under the impression that the average person simply can’t make them–that you have to buy what a factory produced. But whipped cream is actually one of the easiest–and tastiest–things ever! The mixer method is the quick and easy method, but you do need the right equipment. If you’d like, you could also mix by hand with a regular whisk, but it will take quite a bit longer. Pour the cream and sugar into a mixing bowl. Using a hand mixer or a stand mixer with the whisk attachment, beat the whipping cream for 5 to 10 minutes. Stop occasionally and pull up the whisk. If stiff peaks remain, it’s done. If soft peaks gradually sink back in, it needs whipped longer. Be careful not to over whip or you’ll have butter! Once stiff, pour in the vanilla and salt and mix until just blended. The jar method is the fun, get the whole family involved method! It is great for keeping kids entertained especially, so think about using this method during large family gatherings like those during holidays. In this method, two glass marbles are added to a mason jar to increase friction so the cream whips faster and also so the sound will give you a neat clue to how close it is to completion. Pour all ingredients and the marbles into the mason jar. Adjust the lid tightly. Shake, shake, shake! Check every 5 minutes or so. The whipped cream should be thick. You’ll know it’s close when the clacking of the marbles slow down. Store in an airtight container (such as the jar you shook it in) in the fridge. When serving, keep a careful eye out for the marbles! 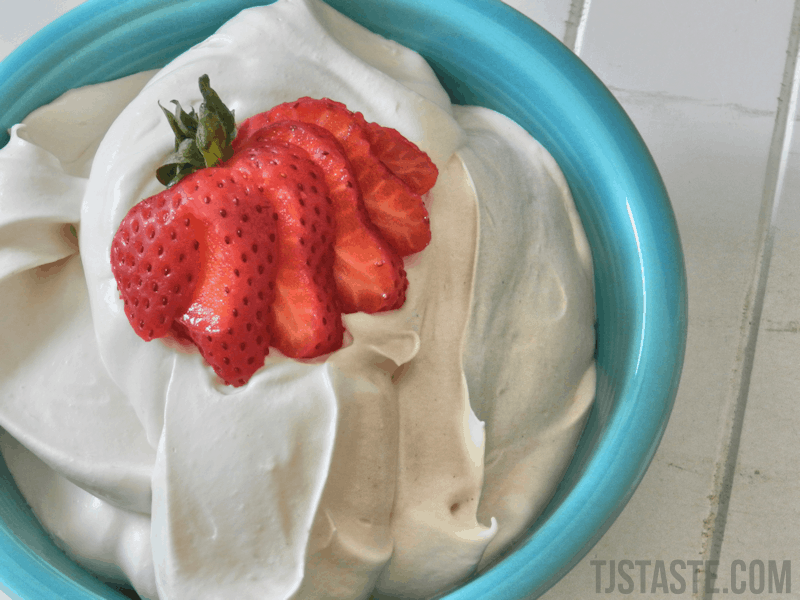 Making your own homemade whipped cream is easy, delicious, and fun! Add the whipping cream and sugar to a medium mixing bowl (if using a hand mixer) or the bowl of a stand mixer (if using a stand mixer, use the whisk attachment). Mix, checking often by stopping the mixer and lifting the whisk up. If a stiff peak remains in the bowl, the whipped cream is done. If soft peaks that gradually sink back in result, it needs mixed more. Be careful not to over mix or you'll have butter. Once stiff peaks result, whisk in the vanilla and salt just until mixed (should only take a few seconds). Transfer to an airtight container and store in the refrigerator. Add all ingredients plus 2 clean marbles to a quart size jar. Screw on the lid and tighten. Shake, shake, shake! Get the whole family involved. Check every 5 minutes or so to see if the cream is stiff and ready to use. When the clacking of the marbles slows down, it's getting closer to completion. Quick, easy and delicious! My family absolutely loves it!